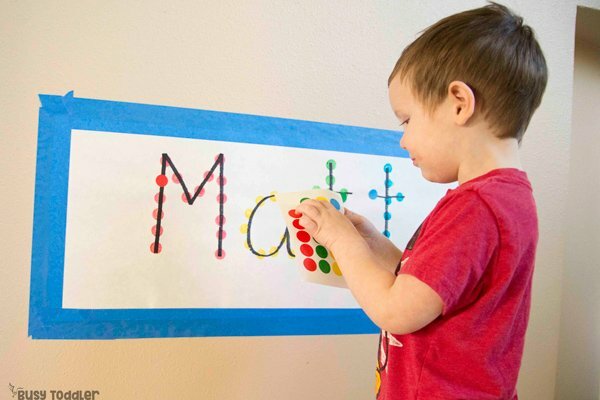 My son can’t use dot stickers… so I made him this to help! 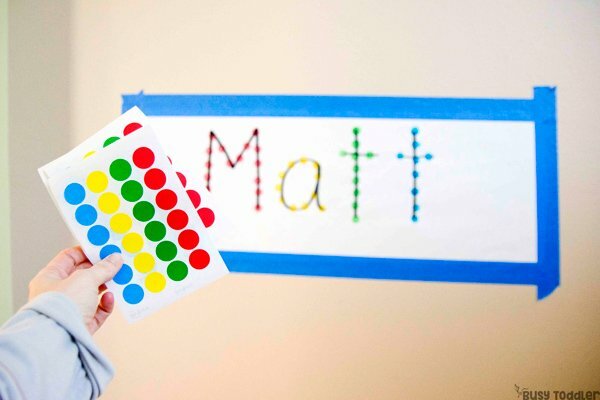 We started using dot stickers in activities before my youngest was born. To say he’s grown up with dot stickers would almost be an understatement. 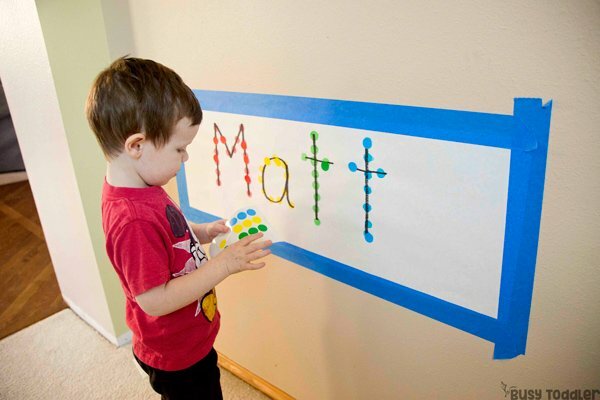 But even with all the fun we have around here with dot stickers, it’s taken him the LONGEST of all my kids to figure out how use stickers for activities. 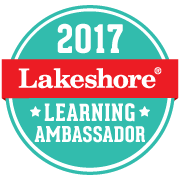 So how do you “help” a kiddo learn to use stickers? RELATED: Curious how I teach my kids? 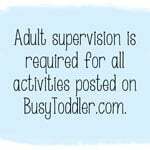 Check out “Playing Preschool” – my at-home activities program. My 29 month old loves to use dot stickers. But whenever he uses dot stickers, he just stacks them on top of each other. I didn’t know you could stack stickers THREE SHEETS HIGH but he’s proven that to be possible. On a big piece of butcher paper, I wrote my son’s name in GIANT letters. Normally, that’s all I’d need to do for a dot sticker activity (see evidence here) but that doesn’t work for him. I need to modify this to meet his needs and help him. 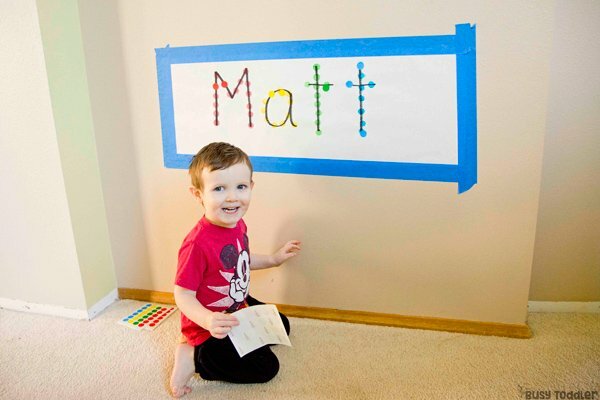 RELATED: Here’s 5 name game type activities from Munchkins and Moms! 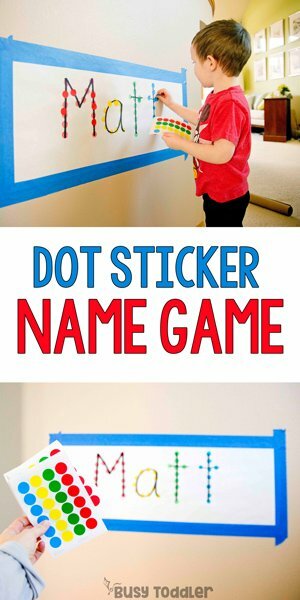 How do you modify a dot sticker activity? I wanted to give my son “purpose” and clear guidelines for where to place his dot stickers. Like I mentioned, in the past, he just stacks them up on each other and that is certainly not going to work for this activity. So I used the Do-A-Dots to give him a place to match the stickers to. 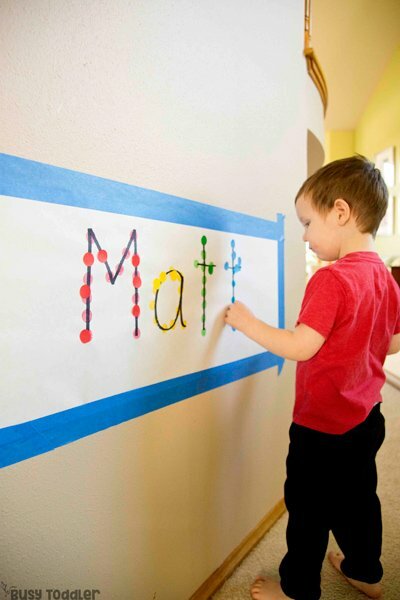 A way to help him see how to trace the letters with the dot stickers! I dotted over each line with a few “dot marks” to make it easy to see where the stickers go. He loved playing this Name Game! 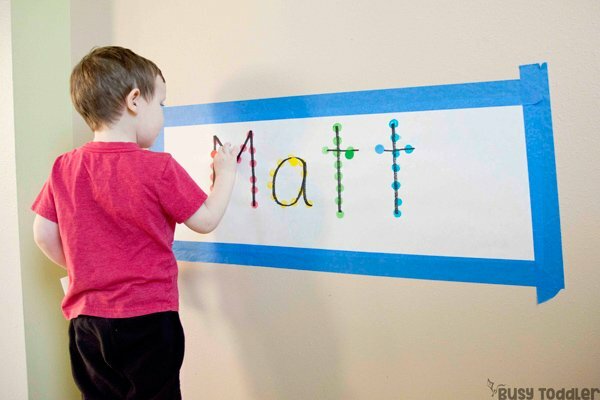 I should also mention that my toddler does not know any letters or sounds but I picked his name for this activity because names are so important to learn to recognize. 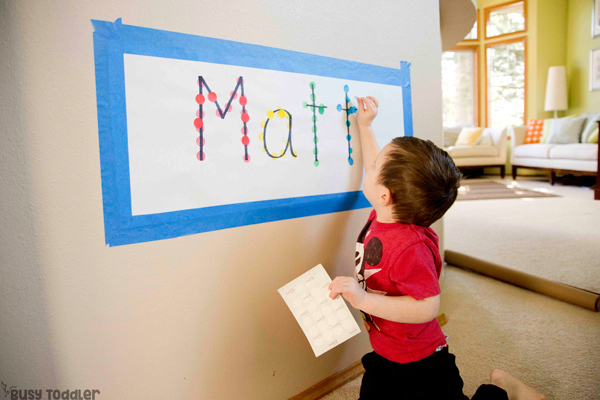 RELATED: Need another name game activity for older kids? Try this one from Days with Grey! I’m not asking him to learn to read Matt. I’m not asking him about the letters in Matt. But I am trying to help him memorize how Matt looks when written. 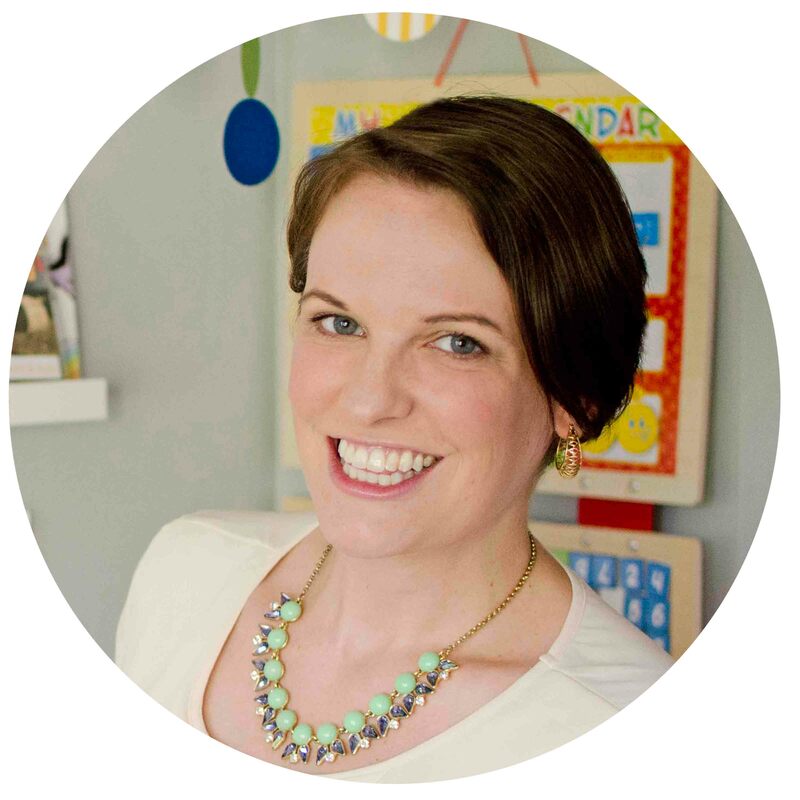 RELATED: Worried about your toddler and preschooler and the ABCs? DON’T BE!! Find out why HERE. What other skills is he learning here? Name game might seem simple…it’s anything but! 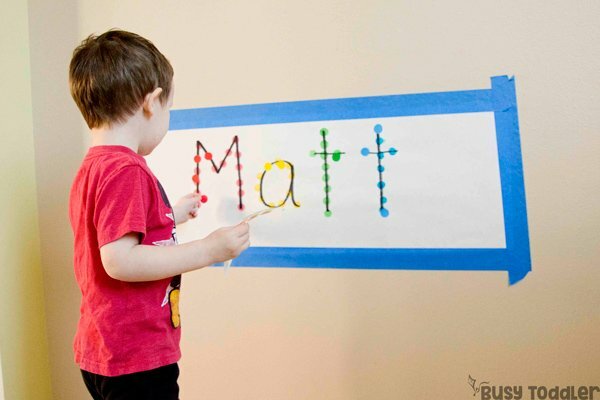 This easy little activity does a whole lot of good and learning for my toddler. 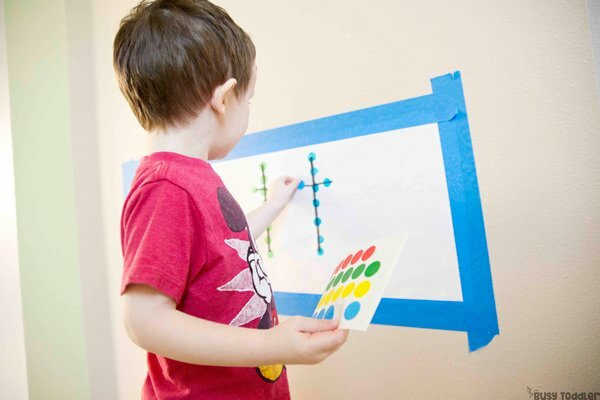 Someday, he’ll be ready for dot sticker activities without the Do-A-Dot guides, but until then…. this worked like a charm! 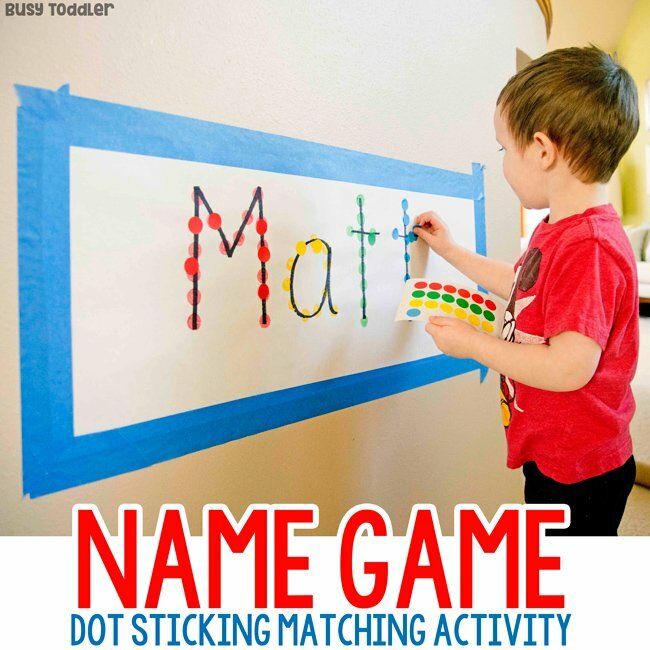 When will you make a name game for your toddler?